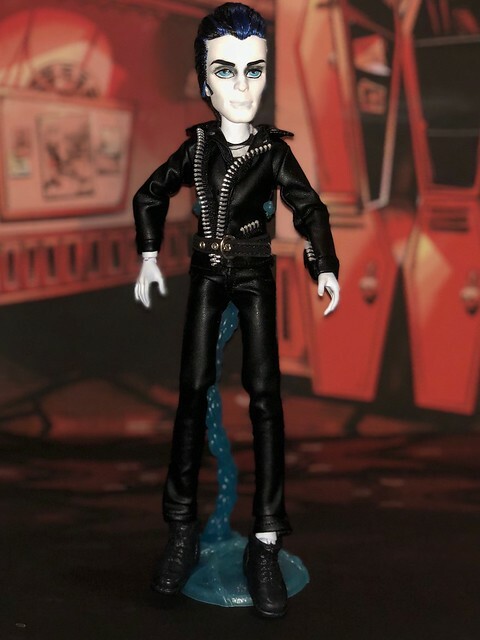 The hyper-boring Ari Hauntington was never a collaboration doll. She was simply a huge mistake on the MS designers' part. What were they thinking, trying to replace Spectra with that lousy cheap ghost wannabe? Tsk, tsk! Shame on them! I would have mind her much if she were another ghost instead of a Spectra reboot. Updating my wishlist for no particular reason. That's so weird! My Lagoona from the same line also had two right hands! Luckily I had an extra Lagoona lying around so they swapped hands. I wonder if all of the We R Monster High Lagoonas were released the same way? No, I just checked mine and it has regular left and right hands. So I guess it was a batch, maybe? Sugar Coated Cedar Wood. I've watch several Cedars and was not convince on her original desinged and passed on sugar coated, for unknown reasons. Fortunately I was able to get her and she's so pretty. Not my favorite picture, but about the only one I took in all 2018. Remembering the line. And deciding what doll from the ones I didn't have would be the best representative of her character for me. The books probably. There's really no much out there on this, and can't think of any custom project. Planning customs. Have a full stash of stuff I wanted for 2 dolls I wanna bring to life some day. Not really. It was a disappointing year in general. Hunting for old releases has become an on and off hobby. The flame is revive every time I have the time, or I get new ideas, but it gets kind of lost in daily life stuff. I wish I can hold on to the dreams a bit more longer. I love monsters and Monster High was a beautiful dream. Get myself into customs, or commission the ones I want. Sets and maybe some old lines I pass on favor of others hoping to get them afterwards. Customs really. I've been wanting a Dryad and a Quetzalcoatl for a while, so hopefully they get done this year. I've eyed 2 different Mexican artists work, so with any luck I'll get these 2 done. Had to cross several dollies I bought or received and added 2 customs I hope to either do, commission or buy one day. Ghoulia is my favorite doll of all times! After SDCC I would say Signature and Love's not Dead. My second and third favorite only have one version of them, Avea and Posea. Congratulations to Neon for giving us beautiful all-year-round pictures! My complete circus troupe! Phew, arranging this photo was exhausting. This is the most dolls I crammed into one photo so far - there's eleven of them!